The tendency to see the local and the global as separate and distinct phenomena has a long history in the academy. And yet today, local-global connections have become apparent for communities and academic institutions alike. In this century of clear and present globalization, colleges and universities are increasingly recognizing that local and global are part of the same system, that one cannot be understood without reference to the other, and that the local communities in which they are located, --urban, rural, and regional-- must now be viewed as globally embedded. 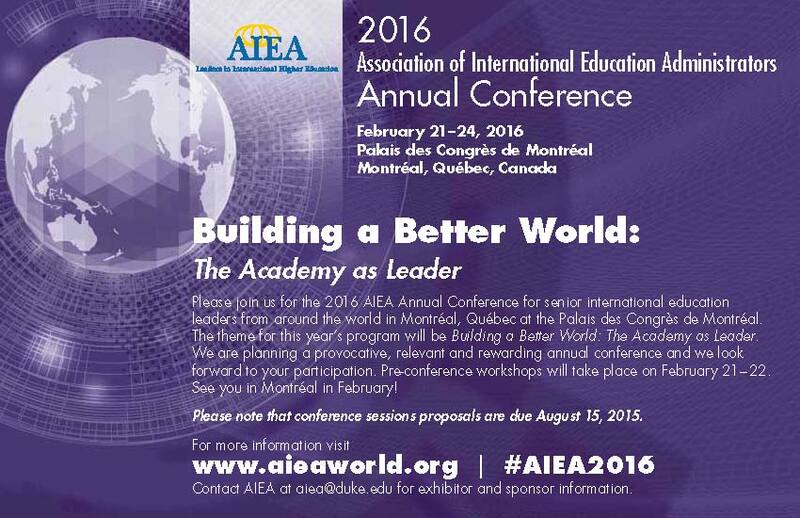 As we gather for 2016 AIEA conference, how might our institutions become more effective regional leaders and stewards for enhancing the quality of life and educational, economic and cultural development for our communities? In answering this question, the imperatives are clear: higher education institutions must consider and communicate the ways in which global forces shaped the communities in which they are located in the past, and are reshaping them in the present. They must understand and connect with the international linkages that increasingly connect these localities with others. And they must prepare all graduates, no matter their discipline or profession, to operate in a globalized world with skill, wisdom, and responsibility. To address these imperatives, and to address ways to build a better community, nation and world, it is fitting that we do so through conversations with global scholars and practitioners gathering in 2016 in Canada, a country noteworthy for coining the term internationalization two decades ago, that is, Knight’s classic definition (of internationalization) as the process of “integrating an international and intercultural dimension into the teaching, research and service functions” of a college or university (Knight 1994). This broadened view of international education matched an emerging awareness of the globalization that was visibly reshaping lives, communities, and professions everywhere and heralded a shift calling for international efforts to spread across all aspects of an institution and to be integrated with each other. Progress has been made these past 20 years, but the urgency of our task and the difficulties associated with the university global leadership role have also increased. Higher education is increasingly challenged to demonstrate its relevance in the face of stagnant economic growth, a world that is increasingly interdependent and therefore often increasingly competitive, and revolutionary advances in communication that bring the far away and unfamiliar closer in time but not necessarily in understanding. A repositioning of global learning in the higher education curriculum and a more intentional engagement with the international dimensions of the communities in which all our academic institutions reside can provide some answers to this challenge. There is a need to identify and better understand best practices associated with institution-wide dialogue that engages in collective sense-making and goal-setting for and with the places and regions we reside. Twenty-first century knowledge production is extensively global, local, collaborative, and interdisciplinary; how can we think more collectively (across all our differences and similarities) to solve global grand challenges, especially in preparing graduates who can actually perform as globally empowered local citizens. In order to nurture greater understanding of the world, do we need to rethink, from a pedagogical, disciplinary, and faculty scholarship viewpoints the increasingly ambiguous geographies in which we live, learn, work, and conduct research? Refreshed thinking about the meaning and value of such concepts as ‘glocalization’ is needed: what does it mean to ‘think globally and act locally’; what evidence do we have of such thinking and action, through initiatives ranging from the individual to leadership provided by the public, private, or nonprofit sectors? An increasingly important question facing higher education is that of accountability and agreed upon ways to measure progress toward new campus and community goals for internationalization. The foremost goal of any institutional change initiative, such as internationalization, is improvement, whether the target is student learning, campus climate, or research productivity. How have colleges and universities made good on internationalization by documenting actual student learning that provides evidence that internationalization has made a difference? What are the quantitative and qualitative values associated with improved global understanding and, recognizing that claims for gains as well as comparisons will be made, how can benchmarks be utilized to measure progress or make comparisons? Benchmarks, in turn, call for evidence regarding how much change has occurred; what is different on campus; what strategies have produced change; what has been the impact, intended or unintended, of the changes? Are there standards for assessing attainment that are universal or applicable to all communities around the world? And how are our institutions and communities being transformed by internationalization efforts? Accountability connotes responsibility and leadership; bringing the local and the global together is essential not merely in terms of cross-cultural understanding and international competitiveness, but a whole host of urgent problems, including climate change, war, terrorism, human trafficking, public health, exploitation of labor, etc. Contemporary examples of the clash of ideological and religious values, fueled by social media, and inimical to notions of free speech on and off our campuses threaten our capacity to contribute to building a more peaceful and just world. Universities are one of the main places where thoughtful, evidence-based analysis can take place to address the most vexing problems facing humanity. What is the role of universities in fostering civil dialogue about contentious issues, dialogue that includes the local, regional and global community? What voice do universities truly have—and who speaks for universities? The Role and Effectiveness of the Academy in Addressing Global Grand Challenges: climate change, religious intolerance, war, terrorism, status of women, human trafficking, public health, exploitation of labor, food security, universal education. University Leadership: what does effective leadership look like?